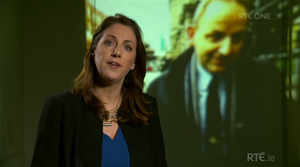 Further to last week’s Prime Time in which Prime Time‘s political correspondent Katie Hannon outlined the sequence of events concerning how a false allegation against Sgt Maurice McCabe ended up being circulated by Tusla. Ms Hannon had further information, after speaking with the solicitor of the woman at the centre of the original allegation made in 2006; and after speaking with someone who has seen the Tusla referral document which contained the false abuse allegation. 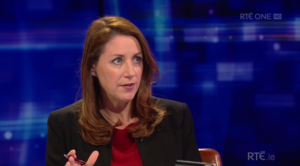 The new information, as presented by Ms Hannon, means there are now conflicting accounts of how events unfolded – as put forward by the HSE, and subsequently the Minister for Health Simon Harris in the Dáil, Tusla, the Gardaí, and the solicitor for the woman at the centre of the original 2006 allegation. 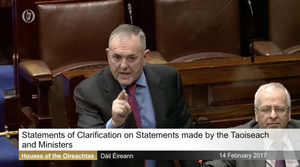 Posted in Misc and tagged Katie Hannon, Prime Time, Sgt Maurice McCabe at 2:43 pm on February 17, 2017 by Broadsheet. Is there any consensus on the events surrounding the original 2006 allegation. It seems to be mentioned in passing, but not analyzed. Did the Garda who was disciplined as a result of McCabe force his daughter to lie about the “hide and seek” incident? Or did he plant memories in her head and coerce her into making an allegation? Or did she genuinely believe there was an incident? I can’t get my head around this part and nobody seems to be discussing it. If a father got his daughter to make something like this up then it is pretty damn egregious. The family deny what the gardai put in their report and they never contacted the gardai themselves. it all seems a bit unbelievable. 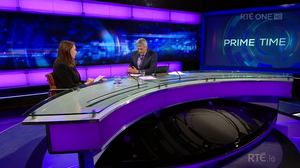 You will that there are a lot of links between gardai, usually marital, and members of staff at tusla and the probation services. What a bunch of bs, I can’t tell with RTE’s coverage whether they are trying to help cover this story up or if they are genuinely trying to give an honest report of the situation. I was using a template with child-molestation charges before I wrote this comment. Sorry for any consternation caused. My understanding of what RTE are saying based on inside information at Tusla it seems, is that the counsellor in Tusla put together a complaint using a document template. The template used wasn’t a blank template but a previous document used to detail a complaint against someone else. Some information was left on the new document/ McCabe’s file (it had the names of “two abusers”). So there was no copy and paste issue in relation to McCabe, it was just a clerical error in relation to not removing/(“failure to delete error”) details of another complaint. But just have a think about it..where were McCabe’s details copied from in error? It wouldn’t make any sense for Tusla to be saying they got his details from thin air and he ended up in a file at Tusla by mistake. There was a complaint made about him. A clerical error was made in one or more documents in a dossier specific to McCabe (“a file”) and that was used as an excuse to say his details were copied in, in error in the whole thing. Again ridiculous. RTE and Katie Hannon are not trying to confuse you at all..you just have to wade through the nonsense. I’m sorry but if anyone believes that this was an “error” then I have a bridge I would like to sell to you. At least one other garda whistleblower had a file opened up by Tusla, this is clearly a deliberate effort by the guards and tusla to set these men up and to discredit them. The copy paste thing is BS and that’s what Katie Hannon was explaining. Name the counsellor. Who is she? That person would be just doing their job..name the Gardai is more appropriate. Then you’d be on the right track as to who instructed him. Rotten to the core. on reflection, based on what the girl’s solicitor said, it seems there are connections between gardai and individuals at Tusla. The stink doesn’t get better with each attempt to retell this. Some fecker should be in jail for this. Oh that is ok then. So the agency that is responsible for creating these reports into child abuse start by copying an old report and adding/deleting where necessary. Nothing to see here them, move along…. I do this kind of thing all the time. Use a template file from a previous project and overwrite it to save time. I’m incredibly careful as ‘failure to delete’ could cost money or a planning decision. I deal with construction projects – not people’s lives, reputations, marriages, reputations, mental health. Sack this person immediately, this is gross, gross negligence. Don’t be ridiculous. This is the public service we’re talking about. What I don’t get from the RTE discussion is that okay, errors happen but it HAD to happen to the one file that caused a life-changing event and forced the McCabes life down one path? What are the chances of that? Is Katie Hannon speaking another language or convoluting something unnecessarily maybe? What you said there is exactly what she’s getting at..and what’s more logical. McCabe’s details weren’t plucked from thin air. MS word allows you to create templates (.dotx). Leave the unique bits blank in the template or put in a big red X for the bits that are unique. When you click on save when you have your details filled in on your template, you have to create a new document..that way your template is how you left it. A template really isnt a previously used document like. Btw if the information is the same for all your documents, you could create an excel file for the unique info and just do a mail merge, selecting the records to merge as required. You need to highlight over you big red x if course when youre telling the mail merge where to put what..it goes from the row headers of the excel file, so tick my document has headers when doing your merge. Haven’t done one in a while but they’re very handy. But anyway use proper templates (.dotx).. much better than writing over stuff. I don’t believe this ‘template’, ‘clerical error’ stuff for a second. The spin doctors know that incompetence is more quickly forgiven than malice, so they are concocting a ‘screw up’ rather than admit to a stitch up. Yeah, of course it was a stitch up. It’s kind of an insult to anyone’s intelligence to say we Ctrl c’d n Ctrl v’d McCabe’s details from somewhere..
That was in response to Sam. I’m pretty sure the HSE/Tusla use SAP for data entry record keeping etc. Assuming that a secure installation is designed & implemented it would be a normal enough ask to have lockdowns in the stack somewhere to prevent things like cut/paste much in same vein as prevention of the removal of data by USB key etc.